but most of them are made (i.e. 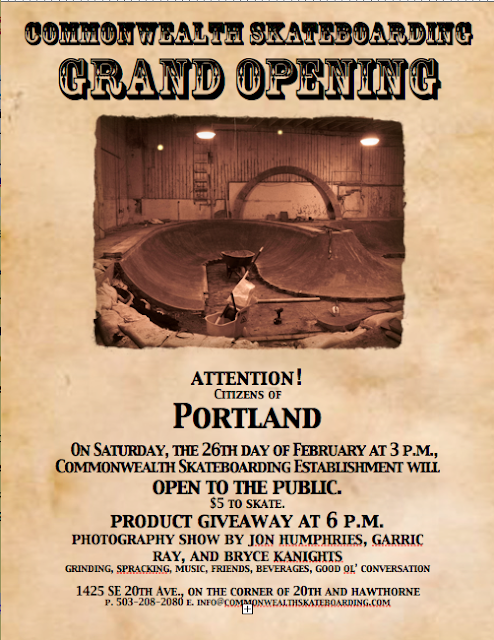 sponsored) by the cities, so it is noteworthy when a new skatepark is actually created by skaters themselves. And that’s what is happening in the city of Portland, Oregon. After the unique skatepark closed last summer, two skaters decided to build their own skatepark and the opening is this week-end, that is in 4 days. The story is brought by legendary Bryce Kanights on http://www.skatedaily.net/ Go visit Focal Point for more insights. Here is an excerpt of the report. If there’s one underlying attitude that skateboarding has instilled within many of us since we took that all-important first push, it’s the independent conviction of “doing it yourself” without rules, a coach, schedules, or a uniform. Individual creativity runs deep in skateboarding and it’s become a character of our lifestyle. Once we begin to fall in line or follow by exactly by what is acceptable or normal, the adventure can get boring and apathetic very quickly. Right? Right. During the fall of last year while sitting indoors as the rain of the Northwest continued to pour outside, Portland skateboarders Jennifer Sherowski and her boyfriend Lance Normine brainstormed with a few friends to create a unique indoor skatepark. The metropolitan area’s only indoor skatepark, The Department of Skateboarding, had shut its doors back in the middle of August and looking ahead, there was no viable alternative for the wet winter months that were on the way. More reading and pictures of the skatepark on www.skatedaily.net/ and Focal Point.